Every year I look forward to. As December approaches my usual battle with the husband about when is acceptable to put up the tree - I lean towards 1st December - he would happily wait longer. It is usually up on the first. There is something so magical I find about a tree all glittering and twinkling in the front room. It makes even fish fingers and chips for dinner seem magical. When the tree start appearing around towns, in windows of houses or in your work place. The beautiful nature of something so simple, a tree - something that represents growth. To be filled to the tips of its branches with baubles and trinkets. I turn positively childlike browsing the towering baskets of decorations as they fill the shops. Our tree is eclectic - to be polite. I'm sure other would think it just a mess. A haphazard collection of things, that the only connection really is they are hanging on the same tree. Well from the outset that would be the only connection. When really they thing which ties all these differing things together is Us. My family. I look in awe as I pull baubles or creations out the box and they evoke such memories to me of Christmas pasts. There are stories between each decoration as I hold them in my hand. I can remember the tales, the moments, the smiles (and sometimes tears) that go with it. I look forward to these moments, to look at a sparkling tree in the corner - and catch glimpses of our story. There are decorations on this tree from our first ever Christmas just me and he. We had moved out in the September - that big step. Into a "cozy" (small) little flat together. We learned to co habit, I learned to cook, he learned to live with me (who am I kidding hes still learning this). We left it later and later to buy our first tree - but we got this skinny little black tree. I was so excited to dress it - bought our first set of baubles. It was artfully gold and pretty. There are still little a gold dove that hangs on our tree from all those years ago. There are decorations on this tree from Maxwell first Christmas - ringing out the 2010. Which leads onto the decorations as he got older he made. From photo frames, to decorated baubles with glitter and the salt dough ones we have made in later years. There are decorations from Nathaniel's first Christmas signalling 2013. That Christmas he was so small, it passed by in blur as I sat and held this little bundle in my arms. I was so tired that year that I remember leaving presents all across the floor with post notes on which K sat and dutifully wrapped late into the night as I cared for the little one. There are decorations on this tree which my parents have bought for us. Each year a new pretty is bought and added to our collection. There are a couple of baubles hanging on the tree which were off my parents tree. One year Maxwell he was nearly 3 - and he loved the sparkly gems that were hanging from the branches. Declaring them treasure. He came home with them in his pocket. There are decorations on this tree which my aunt bought for us. She passed away last year suddenly, she was young. I spent a lot of my young childhood days with my aunt and uncle - who were around 18/19 at the time. As I got older and became a parents, my aunt switched from getting us presents to getting us a decoration. This feels me with joy. As I hang these carefully on the tree. In that moment I think of how she loved the extravagance of Christmas. How she would of carefully selected something like this for us - wrapped up beautifully and her distinct handwriting on the label. There are decorations on this tree which my dear friend Sally has bought/made me over the years. We may have only been friends for a few short years but we found each other and clicked. She is many miles away from me (but how I wish I could pop round for a cuppa) but she is always at the end of the phone, a quick text, an instagram comment or a phone call. 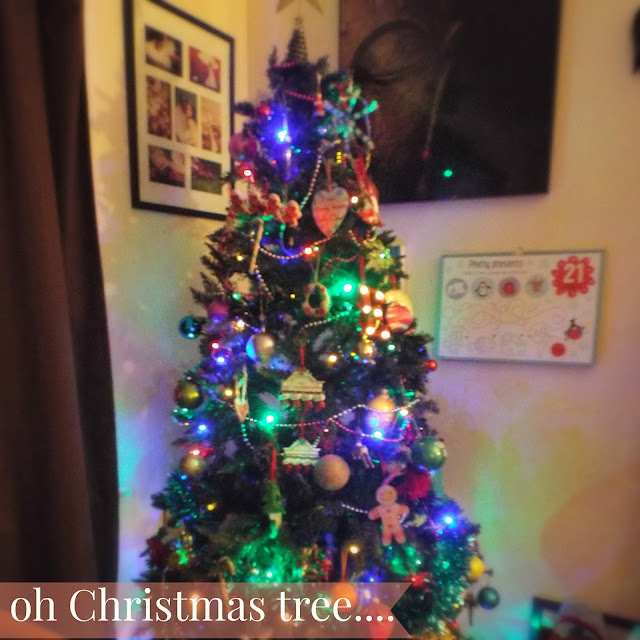 We decided that our kids are very lucky and receive so much at this time of year - that actually would rather buy each other a tree trinket to adorn our trees with each year. Miles apart maybe but in our thoughts always. There are decorations on this tree I have sat and made with the boys, that i have planned and crafted away. There are decorations on this tree that display photos, or make the year. There are decorations on this tree that celebrate us as a family. There are decorations on this tree which have been gifts from friends. There are decorations on this tree I have sourced and added to our collection. There are decorations on this tree I have bought in places we have visited. These decorations may be ever growing, and some years they may not all get an airing on the tree. But in years to come when my boys are bigger and they have families of there own. I will be able to package up in tissue paper and carefully pass these onto them. For them to hang on their trees. For them to look and find the memories of their childhood Christmases. It may sound soppy - but I love our eclectic tree. It reflects our eclectic family too.